Want an empathy workout for your brain? Read a book! 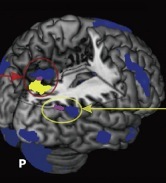 At right the blue shows activation patterns associated with emotional comprehension (blue) and perspective taking (yellow) when reading a story. It turns out, when we read an emotional work, we activate a complex mentalizing network in order to think about the mental state of another person. Imagining a person in a different place takes more brain power (reading slows) and also activates the spatial network necessary to set up a scene in the brain. No wonder reading complex novels with all their differing personalities, motives, and scenarios can be an exhausting process. If we want to train children up in empathy, then stories are a great way to do it. Seeing the complexity of the pathways required for empathizing should help us understand why people with sensory processing challenges have such difficulty projecting themselves into stories and empathizing with different story characters. But this spatial network can be trained and research suggests empathy can also improve. From Harvard's Mass General, 8 weeks of a meditation-mindfulness stress reduction course showed changes in cortical networks like this story network associated with empathy, sense of self, and stress.